A Roland woman died on Thursday due to injuries sustained in an utility task vehicle (UTV) accident. 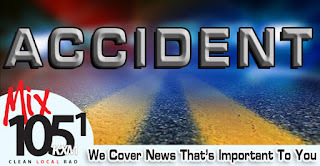 The Oklahoma Highway Patrol reported that Mary Tibodeaux, 39, of Roland was a passenger in a 1999 Kawasaki Mule operated by Jim Beaty, 49, of Sallisaw at the time of the accident. 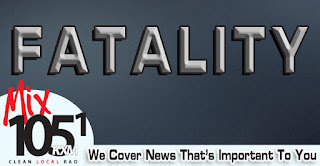 The OHP report states that the vehicle was traveling eastbound on county road 1060, 6 miles east of Sallisaw when Tibodeaux lost her hat, attempted to retrieve it, and fell from the UTV and struck her head on the asphalt. The condition of the driver was normal and seatbelts were not in use. 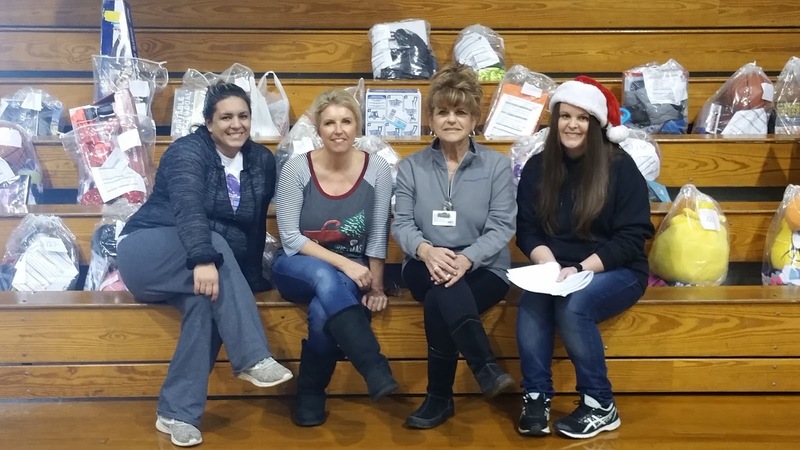 The Sallisaw Community Partners completed their Angel Tree projects on Thursday to provide Christmas gifts and holiday dinners for families in the Roland, Moffett and Liberty communities. 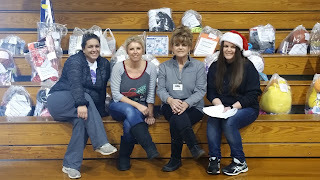 They reported that, with the help of many community members and partners, 169 children will receive gifts and their families will receive Christmas food baskets and turkeys. Helping with the project are, from the left, Heather Silva of People Inc., Melissa Lowe of KiBois Foundation, Connie Olcott from the Health and Wellness Center, and Lindsie Dyer of People Inc.
A California truck driver is dead after his tractor-trailer rig rolled and came to rest on its top Thursday morning on the westbound lanes of Interstate 40. The name of the driver had not been released as of 3 p.m. Thursday by the Oklahoma Highway Patrol. Interstate 40 at the 303 Mile Marker, at the Dwight Mission Road exit, is still blocked by the semi-tractor-trailer, said Sallisaw Fire Chief Anthony Armstrong. Because the upended tractor-trailer is on its top on the I40 overpass, westbound traffic is being directed onto the Dwight Mission Road off-ramp and back onto the interstate via the Dwight Mission on-ramp, Armstrong said. 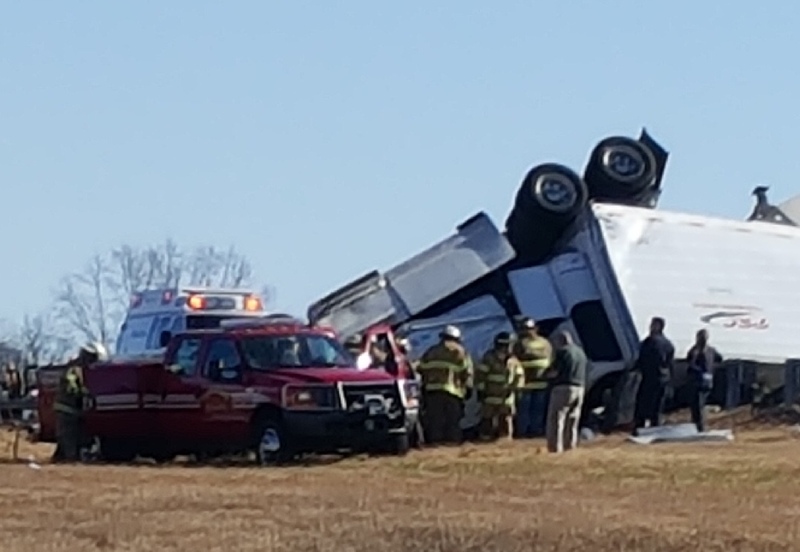 Armstrong said the Sallisaw Fire Department rescue truck was dispatched at 11:51 a.m. to the crash to assist McKey Fire Department. Armstrong said the semi-truck apparently hit both guard rails on the overpass before rolling. He said the deceased truck driver was trapped in the upside-down cab for about 45 minutes while firefighters worked to free his body. The truck was carrying frozen chickens, Armstrong said. Armstrong said firefighters were on the scene until 1:45 p.m. Thursday and he expected the westbound lanes on I40 to be blocked for some time while the cleanup continued. He said the Oklahoma Department of Transportation was on the scene cleaning up the area, but the semi-truck was still blocking both lanes. 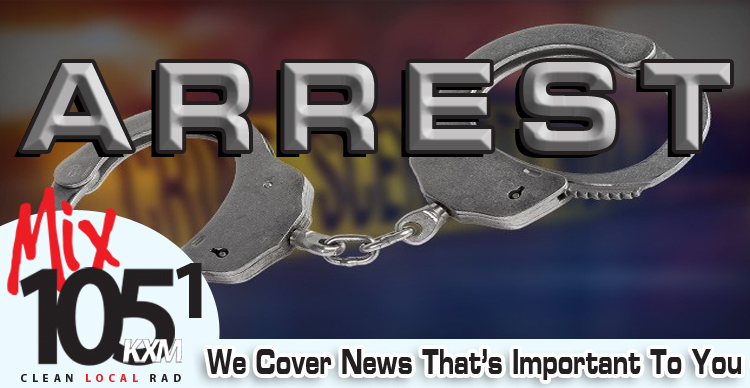 A 26-year-old man from Gans was booked into the Sequoyah County Jail in Sallisaw on several charges after, in his attempt to flee from police, he drove through a police investigation. Darin Schmidt was booked on assault and battery, having a dangerous weapon, petty larceny, public intoxication, and leaving the scene of an accident involving damage. Muldrow Police Chief George Lawson said Schmidt began the evening on Tuesday by shoplifting two six packs of beer from the Quickway Convenience Store in Muldrow. He then stole a vehicle, left running in the parking lot by a store customer, and drove away. He drove away and into the scene of an investigation by Muldrow police into a shooting on Southwest 9th Street. Later on Tuesday evening, Lawson said Schmidt showed up at his uncle’s house, and began “beating up on his uncle’s house and vehicle.” Police were called and Schmidt was arrested and taken to the Muldrow Police Department. At the department, Lawson said Officer Jerry Brook recognized Schmidt, and he was booked into the county jail on numerous charges, and where he is being held without bond. About 100 warm, fuzzy blankets were donated to the Sallisaw Animal Shelter on Wednesday. Carol Wood of Sallisaw collects and delivers the donations. Assisting Wood, on the right, are, from the left, Josie Lockhart, and Noah and Eli Riggs, Wood’s grandsons. Carol Wood of Sallisaw, with her helper grandsons Noah, age 4, and Eli Riggs, age 7, and a friend, Josie Lockhart, delivered about 100 blankets to the Sallisaw Animal Shelter on Wednesday morning. Wood said helping the homeless animals is a good lesson for her grandsons, who also enjoy playing with the dogs and puppies at the shelter. Wood began donating to the shelter several years ago, and said every time she thanked donors on Facebook, she got more donations. These donations came from Becky Randolph, Lou Ann Monroe, Sue Brooks, Don and Ryan Morgan, Jordan and Eric Riggs, Lacosta Oberste, Denise Kostka, Stephanie McClure, Ernie and Judy Martens, Sue Burton, Peggy Lawless, Rajena Gilliam, Armstrong Bank and Randy and Carol Wood. 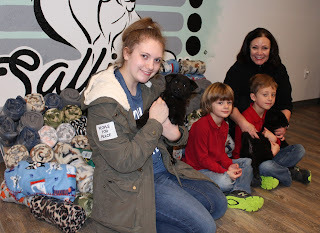 Ro Poindexter, who leads the Guardian Angel volunteers at the shelter, said the blankets are just the right size to fit the shelter’s Kuranda beds, which allow the dogs to curl up off hard and cold floors. She said the Kuranda beds were also donated to the shelter when the new building was completed. Noah and Eli were playing with two nine-week old Chow mix puppies at the shelter. Randy Freeman, Sallisaw’s animal control officer, said the puppies are just right to be adopted for Christmas. On Wednesday Muldrow police were trying to get an arrest warrant for a 26-year-old former resident who allegedly shot a Muldrow man on Tuesday evening. Lawson said Jones should be considered armed and dangerous. He reported Owens was transported to Sparks Regional Medical Center by ambulance Tuesday evening with a gunshot to the chest. He is expected to recover, Lawson said, but the bullet was still lodged in Owens’ back. Doctors were expected to evaluate the wound on Wednesday to determine if the slug should be removed or not. Since police don’t have the bullet, it is not known what type of gun the suspect used. 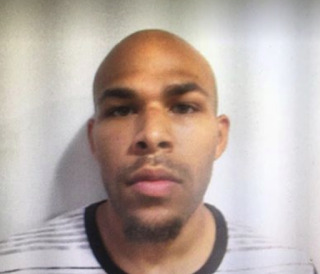 Muldrow police ask that anyone who knows the whereabouts of Jones to please call the police department at 918-427-4431. 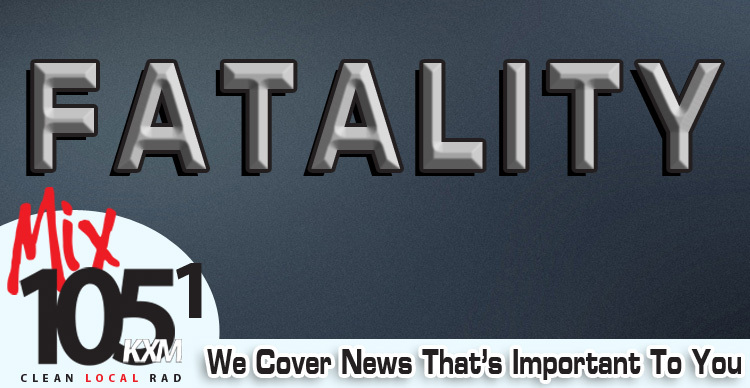 The shooting occurred at about 5:11 p.m. Tuesday at 109 SW 9th St. in Muldrow. Muldrow Police continue to search for a suspect in a shooting that occurred Tuesday evening. According to Muldrow Police they are looking for Tracy Jones, 26, pictured above, who allegedly shot David Owens, 38, in the chest. Officers were called to 109 SW 9th at 5:11 p.m. where they found Owens who had been shot in the chest. Owens told officers that he had been shot by Jones during a drug deal. Owens was transported to Sparks Regional Medical Center for treatment. 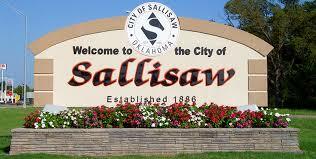 Keith Skelton, Sallisaw’s assistant city manager, will be the acting city manager, the city commissioners decided at a special meeting Monday. He will fill the post left vacant by Clayton Lucas II who resigned Dec. 11 after the board voted three to two to fire him at a previous meeting. Skelton said Tuesday the commissioners will seek applications for the city manager’s job after the first of the year. The city commissioners also set a special meeting for 6 p.m. Jan. 4 at the city’s water treatment plant to hear a water study; voted to not let a contract for mowing and returned mowing chores to city employees; and heard a report from Skelton on city projects. A 52-year-old Arkansas man was charged Dec. 5 in Sequoyah County District Court, Sallisaw, with eluding a police officer, and misdemeanor counts of possession of a controlled, dangerous substance, running a roadblock, unlawful possession of drug paraphernalia and speeding. 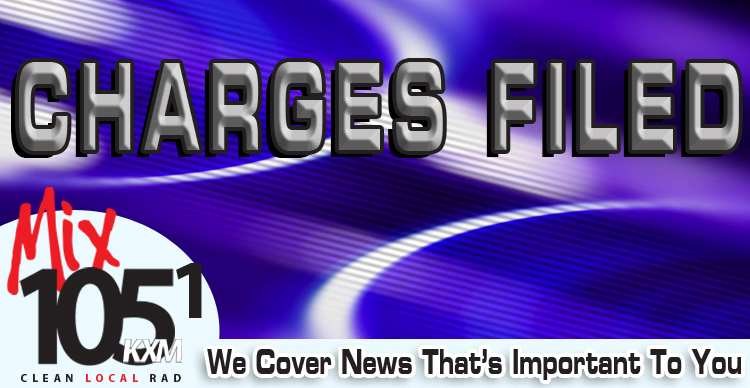 Luis Chavarria Lopez entered a not guilty plea to the charges. His next court appearance is Jan. 17 on Associate District Judge Kyle Waters’ disposition docket. According to the investigating Sallisaw police officer’s report, Lopez was driving west on Interstate 40 at about 1:30 a.m. on Dec. 1 when the officer was dispatched to help a Muldrow officer stop Lopez whose vehicle was clocked at 120 miles per hour. The Sallisaw officer reported the Lopez vehicle was “swerving from lane to lane and driving in the middle of both lanes." The driver showed to have no regards of the safety of the other vehicles he was passing at a high rate of speed. The Sallisaw and Vian police pursued the vehicle into Muskogee County where it apparently ran out of gas. The officers then approached the vehicle and demanded the occupant get out. When he did not, the officers used batons to break out the driver’s and passenger’s side windows. The officers then removed Lopez from the vehicle and placed him in custody. 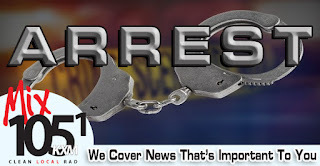 The investigating officer reported a search of the vehicle uncovered a green leafy substance that field-tested positive for marijuana, and a glass smoking device commonly used with methamphetamine. Money taken later from Lopez was found to have a white substance that also tested positive as methamphetamine. Carl Albert State College (CASC) announces they will continue providing tuition waivers to high school juniors for concurrent classes. 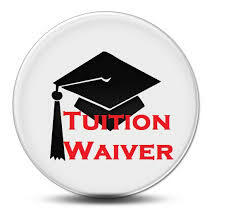 At CASC, high school juniors and seniors tuition is waived for up to six credit hours per semester. According to Oklahoma State Regents for Higher Education policy, CASC cannot waive course fees, therefore fees are the responsibility of the students. Many benefits are associated with concurrent classes. Students can save money on the cost of their overall college education, they can reduce the time they spend as full-time students earning their college degree, they are better prepared when they become full time college students, and their concurrent classes can transfer to any public colleges in Oklahoma. There is still time for high school students to enroll in concurrent classes this spring at CASC. The 2018 spring semester begins Jan. 16. For information, call the Enrollment Center at 918-647-1248. Well-wishers swarmed the Sequoyah County Courthouse Monday, to say goodbye to one of the most popular couples in the county. Tony and Tricia Yates will be retiring at the end of 2017, and friends and family stood in line to wish them well. The Yates have spent over 60 years in Sequoyah County’s courthouse, but it wasn’t always together. Tony and Tricia are not that old. While some may come to the courthouse to wed, hardly anyone meets their significant other there. But that’s what Tony and Tricia did. About 14 years ago, Tony recalls, circumstances led to the couples’ meeting and wedding. Tony Yates has served as the county’s Extension Educator for Agriculture and 4-H Youth Development for 33 years. Tony Yates said he was working in a grocery store in Coffeyville, Kan., when he got the job as the county’s agriculture agent, as it was known back then. He replaced retiring Phil Nowlin. Nowlin served as the county ag agent or assistant for over 31 years. But Yates, like Nowlin, found he liked the job. A graduate of Kansas State University with a degree in animal science, Yates was made for the job of helping local farmers, cattlemen, gardeners, and 4-H kids. Now Yates is looking at retirement, with no new questions from gardeners or 4-H kids. He asked visitors who are already retired what they do to stay busy. Most told him to volunteer and get out where the people are. Yates said he has plenty to do at home on the Yates’ 140-acre ranch. “I have plenty to catch up on,” he said. “I will be cutting cedar trees, and cleaning up the barn, and looking for a place to hide from Tricia,” he added with a grin. The Yates have plenty to keep them busy, with two sons and three daughters between them, and seven grandchildren. Yates said they are raising Hereford cattle, and the grandchildren show heifers and lambs, and have four horses to cowboy on. The Yates also like to travel, and recently visited Hawaii. Tony said they want to go back there some day. But the Yates will be gone from the Sequoyah County Courthouse on Dec. 29, and they will be missed. Yates said new ag agents are being interviewed, and the new agent will be responsible for both Sequoyah and Adair Counties. Sequoyah County Commissioners voted to let a burn ban expire at midnight Monday after rain fell on the county Sunday. 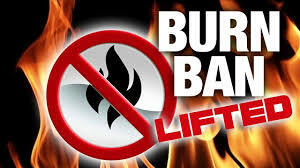 Steve Rutherford, Sequoyah County Emergency Management director, said county officials plan to continue monitoring weather conditions however, and will review the decision to lift the burn ban on Wednesday. A 38-year-old Sallisaw woman was charged with child neglect Wednesday in Sequoyah County District Court, after the 2-year-old female child she was babysitting was bitten in the face by the babysitter’s pit bull dog. She told the officer the dog tore the child’s flesh from under her right eye, down her cheek to under her nose and her top lip. She said the dog tore a piece of flesh from the child’s face, a handful of hair from her head, and left a laceration on her head which exposed her skull. The child’s parents later told police the child was in a Tulsa hospital and was in good spirits but could not eat solid food. Doctors told the family several graphs would be needed to repair the damage. The dog was also taken out of the home by Sallisaw Animal Control officers. The investigating officer had the Department of Human Services do a safety plan for McCullah’s family, because of a second dog in the home, and to which McCullah agreed. Charges were filed against her on Wednesday and an arrest warrant issued, with no bond until McCullah’s initial appearance before a district court judge. Anchor Financial Services of Sallisaw was named the Sallisaw Chamber of Commerce Business of the Month for December at the chamber’s membership luncheon on Wednesday. At the award presentation are, from the left, Cheryl Mills, chamber presdient, Mary Bowen, Anchor Financial Services manager; and Davonna Oliver Carroll, assistant manager. The Sallisaw Chamber of Commerce closed out the year with the annual December Membership Luncheon held at the First United Methodist Church in Sallisaw. -School Division: Indian Capital Technology Center, first; Cub Scouts, second; and Diamond Dazzlers, third. 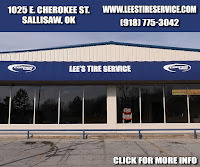 -Churches and Organizations: Sallisaw Police Family, first; Old Sallisaw High School Association, second; and Apostolic Faith Church, third. The awards included a trophy and $125 for first, $100 for second, and $75 for third place. The winners in the chamber’s storefront decoration contest were also announced. See the winners in the photos below. Judy Martens, the chamber executive vice president, also announced the new chamber directors are Dr. Chris Orendorff, Marley Abell, Dr. Aubrey Henshaw and David Hadley. Christmas entertainment was provided by the Liberty Elementary fourth graders, and Cazadores Mexican Restaurant catered the luncheon. 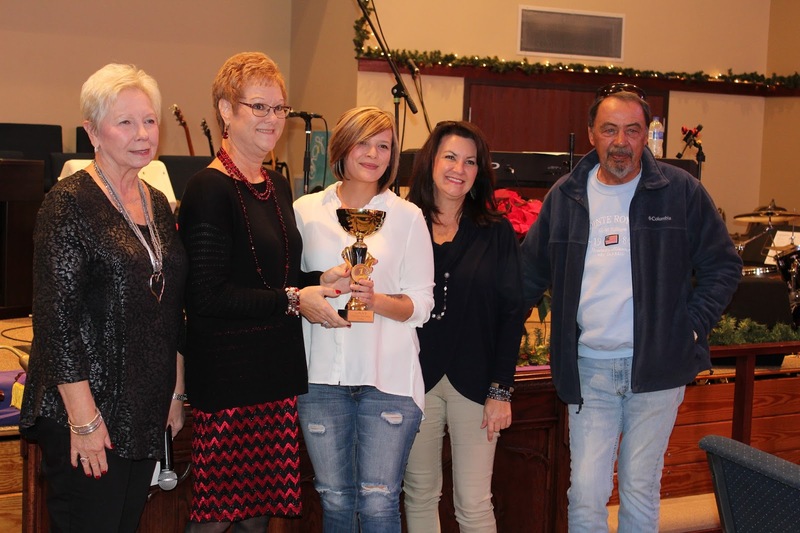 The Sallisaw Chamber of Commerce announced the Christmas Storefront Decoration winners at the chamber’s December membership luncheon. First place winner in the east division was the Sallisaw Tag Agency. 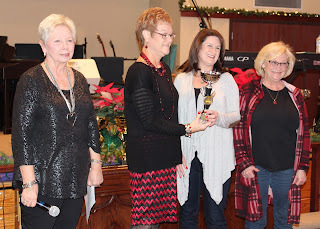 At the award presentation are, from the left, Cheryl Mills, chamber president; Judy Martens, the chamber’s executive vice president; and Mirna Duke and Kylie Rutherford from the tag agency. 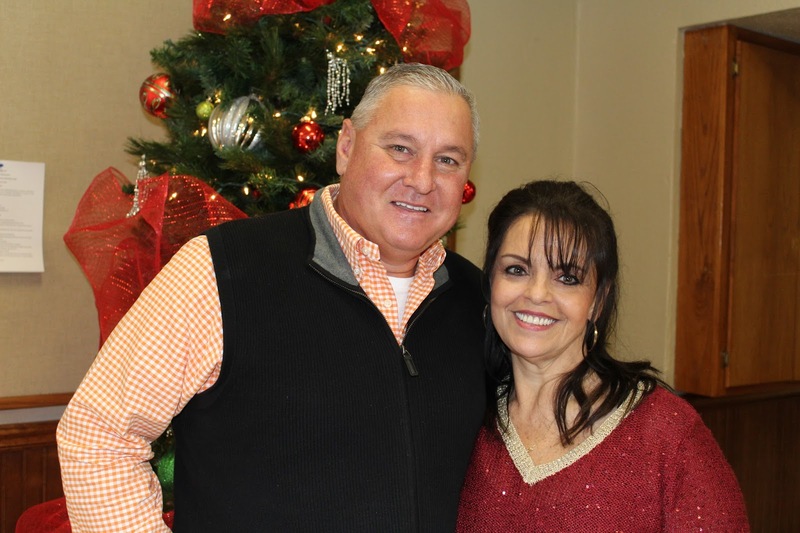 Greenleaf Properties was named the winner of the Sallisaw Chamber of Commerce Christmas Storefront decoration contest for the west end at the chamber’s December membership luncheon on Wednesday. 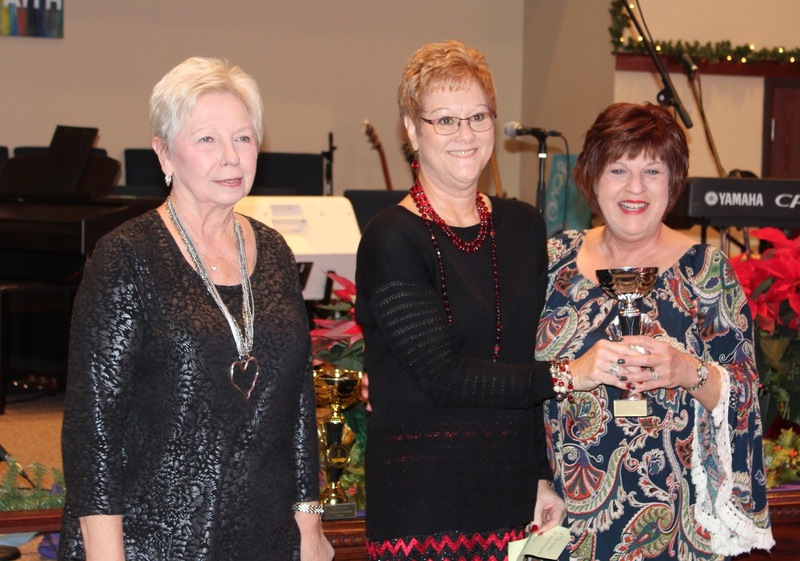 At the award presentation are, from the left, Cheryl Mills, chamber president; Judy Martens, the chamber’s executive vice president; and Rhonda Lewis-Merrill, Rachael Clifton and Tony Venters from Greenleaf Properties. 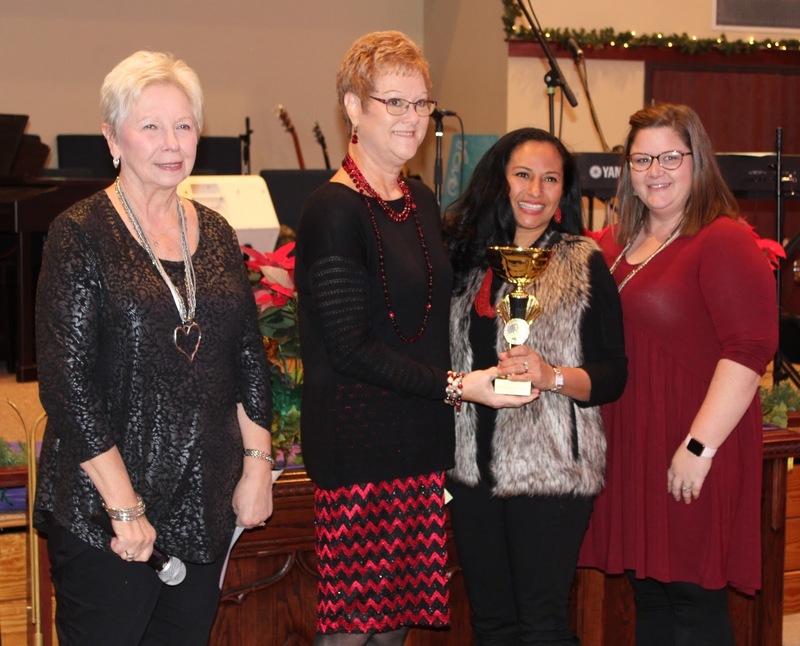 Village West Apartments in Sallisaw won second place in the Sallisaw Chamber of Commerce Christmas Storefront decoration contest for the west end at the chamber’s December membership luncheon on Wednesday. 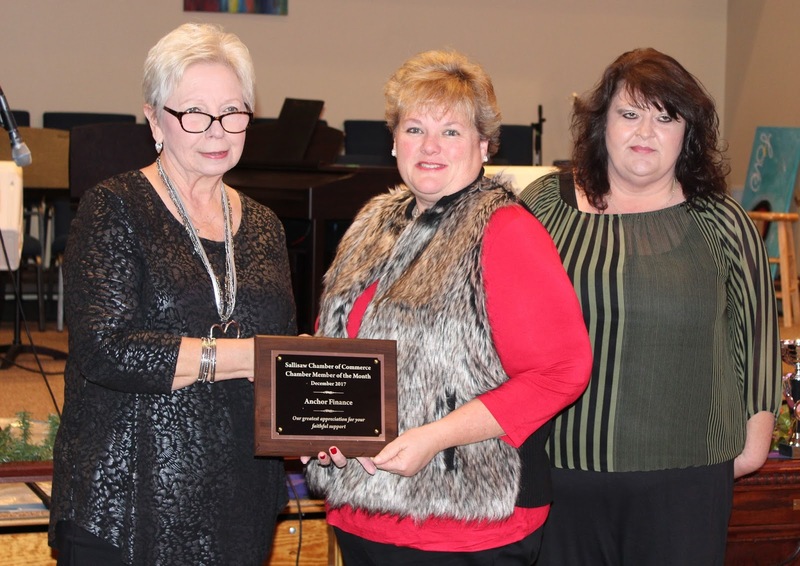 At the award presentation are, from the left, Cheryl Mills, chamber president; Judy Martens, the chamber’s executive vice president; and Angie Crawford and Billie Spears from Village West Apartments. National Bank of Sallisaw won second place in the Sallisaw Chamber of Commerce Christmas Storefront decoration contest for the east end at the chamber’s December membership luncheon on Wednesday. 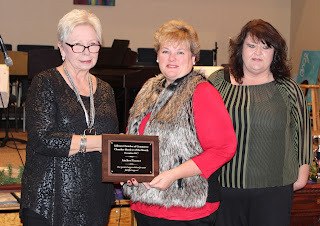 At the award presentation are, from the left, Cheryl Mills, chamber president; Judy Martens, the chamber’s executive vice president; and Glenda Callahan from National Bank. The Old Sallisaw High School Association won first place in the central division of the Sallisaw Chamber of Commerce Christmas Storefront decoration contest. 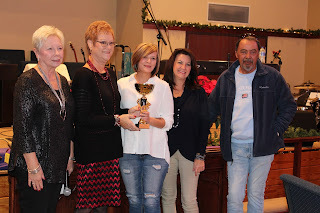 The awards were presented Wednesday at the chamber’s December membership luncheon. At the presentation are, from the left, Cheryl Mills, chamber president; Judy Martens, the chamber’s executive vice president; and Jackie Pop from the Old High School Association. 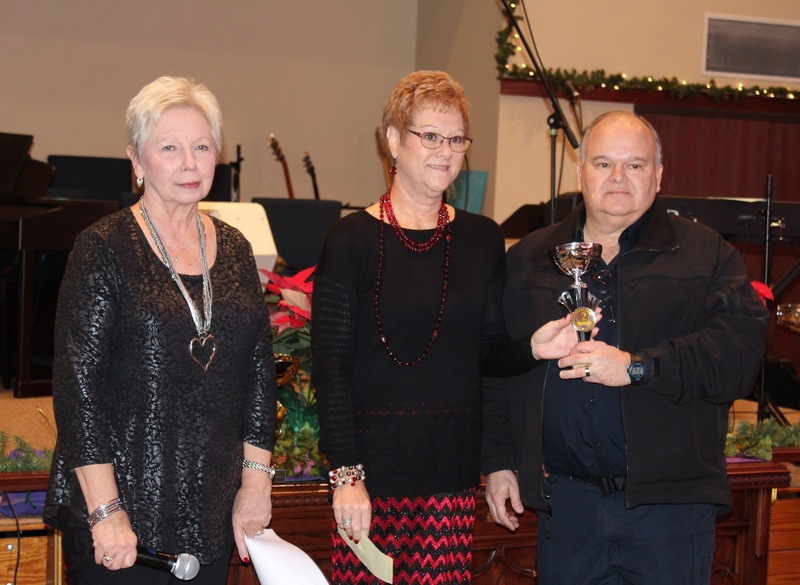 The Sallisaw Police Department won second in the Sallisaw Chamber of Commerce Christmas Storefront decoration contest for the city’s central division. 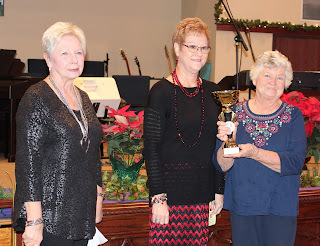 The awards were presented at the chamber’s December membership luncheon on Wednesday. At the award presentation are, from the left, Cheryl Mills, chamber president; Judy Martens, the chamber’s executive vice president; and Sallisaw Police Chief Terry Franklin.